I retract from normality and suspend it's weight upon my eye lashes. The end is the self, a revelation searches. The revolution has been set by blunt eyelashes. Meanings have been lost, only to you— nothing is lost. That grip apples and the voids of communication. are the same in the differences at which everyman discovers them! " The sad people responded in giggles and carless grunts. And the man of everything found a revelation. 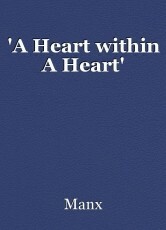 A heart within a heart.— That has no bindings. And May be the blood which governs the heart. It shows itself to be nothing but trickling blood, pulping in infinities and artificials. As thick masks of blood blotch their empowerment. The only certainty is eternity, external and internal are divided by bruised affections. But parents are the reason for tight discourse. This is why the plain is dry and narrow! To the Christian, don't drink the wine. © Copyright 2019 Manx. All rights reserved. Bass Brinson And His Jesus.